Our current reality is that we are witnessing a lot of abuse of power in this world: By men, by women, by our bosses, our parents/family members, our governments, the freaking Catholic Church (yuck) etc. When I started having past life visions at the age of 30, it was all about the terrible things that had happened to me: how I had died in terrible accidents, loosing my kids in accidents, being burned as a “witch”, committing suicide because of unrequited love, being sexually abused etc to name just a few things. And much of what I saw in these past lives, explained a lot about my current life’s struggles and fears. Until one fine day, at the age of 35 I started having different visions. My psyche had decided I was “strong” or “mature” enough to embark on a much darker journey: I was ready to see all the terrible things I had done to people. It was extremely painful to see that, I’m not going to lie. Suddenly I wasn’t the victim anymore. I was the perpetrator. I wasn’t the one was betrayed, but the one who betrayed, the one who killed, the one who used her powers and gifts to harm people.The one who manipulated people to get what I wanted. How did this awareness help me you might ask. Why would I even see a need to “go there”. Some of us might feel stuck in an “abusive” cycle. We might feel we get abused regularly or at least have been in the past: be it emotionally, verbally, physically, spiritually or sexually. I have worked with many women feeling stuck in their life precisely because of this pattern. – Abused by their employers and/or colleagues in form of mobbing, racism at work or sexual harassment. – Or women who suffered all sorts of abuse within their families or intimate relationships. 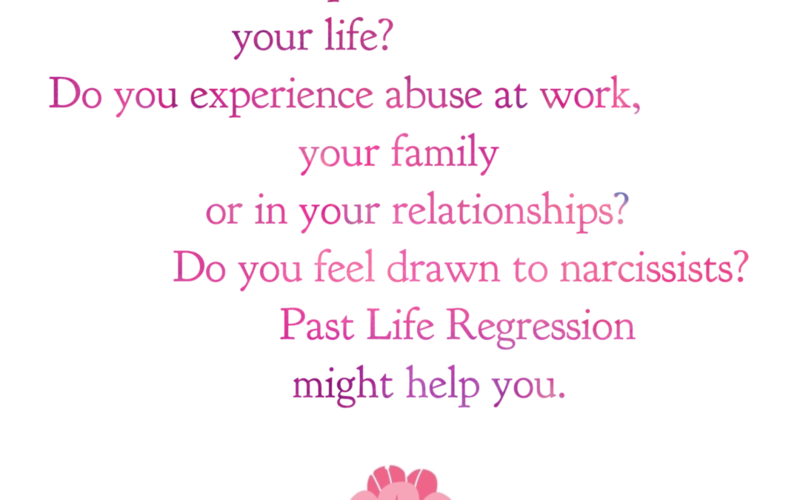 All of this can be traced back to abusive past lives. Now, not all of these women will have had past life visions of how they harmed or abused someone first. As I said above, it took me nearly five years to go there myself. But those that have been working on themselves and have been ready to see their truly dark side, found out all the “terrible” things they did. —> We might have all been sexually abused and the abuser (one of my clients was a massage therapist specialising in massaging women with sexual trauma. She found out she was doing that job as “karmic lesson”, as in the life before she was a man who had sexually abused women. So you see, even our jobs are sometimes chosen for one reason: to repay karma. 1) You had many other lives where you already were abused, and in order to finish this pattern you need to travel further back, to heal, to release, to understand. 2) You might find out that in a past life you were the one starting this abuse. Are you ready to dig deeper into your soul and understand your own darkness? Are you ready to step out of abusive patterns in your life? Join me in my 4 week online “Explore Your Past Lives” Program, where we tackle this topic in week 3. Click here for more info. Or contact me in case the program isn’t currently running, yet you would like to work on it 1on1.